Order your Parker Ingenuity Classic Black Lacquer 5th Technology Pen today from FahrneysPens.com. Fine Pens, Refills & Luxurious Gifts – great prices & fast shipping. The revolutionary Parker Classic Black Lacquer Ingenuity 5th Technology Pen features a fifth way of writing, combining the best of fountain pen, ball pen, rollerball, and porous point. Its cutting-edge point lies under an engraved metallic hood styled like a nib, providing an effortlessly smooth gliding point that easily adjusts to your writing style. Ingenuity has been created exclusively for use with the Parker 5th Technology refill – for pleasurable writing in a modern, high-end design. 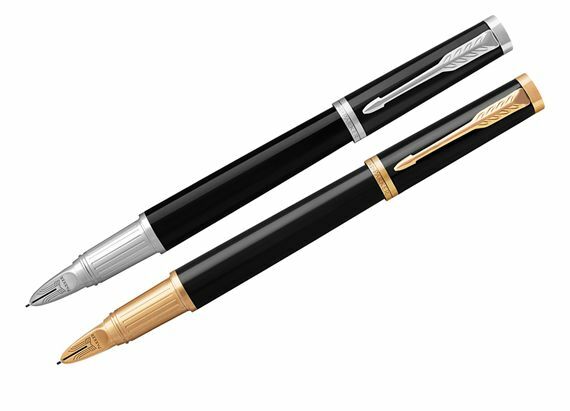 Parker has launched a new range of glossy black lacquer Ingenuity with chrome or gold plated accents. The line upgrade includes an updated shell pattern front-section, a new arrow clip and wider three ring band. The Large Black Lacquer Ingenuity makes a big statement! Choose your favorite and experience the expressive flow of writing with Parker’s Ingenuity!